Customers often ask us to help select antennas to assure sufficient range of their wireless communication systems. Providing an answer though involves more than antenna parameters -- we need to consider the link budget. There's a lot of physics in a link budget. Way too much for this post. Happily, best RF engineering practice reduces the problem to plug and chug using a spreadsheet, such as this excellent link budget calculator by Maxim Integrated's Martin Stoehr. To illustrate, let's explore a link budget of a not-too-hypothetical scenario. Say you are the technical wizard for the conductor of the annual spectacle celebrating the motherland. 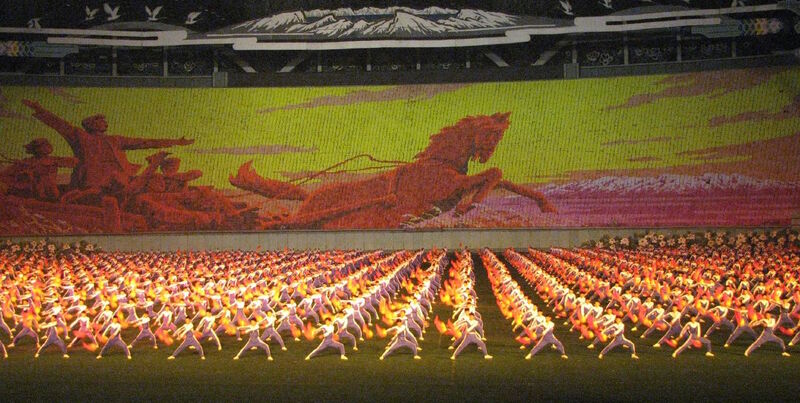 During the show a full-speed five jet flyover will be synchronized to the stadium card animation of flying horse Senrima escaping its earthly bonds. The Exalted Leader will be wowed...if you can sync it up (this could be life threatening). The MiG-15 jets top out around 600 miles per hour at low altitude...that's about 10 miles per minute or 900 feet per second. The stadium is about 1500 feet long, so precise timing of the flyover and the ending of the three minute animation is essential. Let's stipulate these venerable machines have communications antenna gain of 0 dBi at 88 MHz and radio receiver sensitivity of -87 dBm (accounting for all RF chain losses). The conductor wants you by his side with your 3 watt power amplified handie-talkie equipped with a -15 dBi stubby antenna; and he wants the in bound jets to hear the countdown at least one minute before his card animation starts so that the formation can intercept the 30 mile (3 minute to fly-over) at precisely the GO! moment, then update the lead pilot every six seconds (one mile increments) about the progress of the show. So let's look at the communications link budget, and leave it as an exercise for the reader to explore the equations at your leisure. Ignoring obstructions, inputing the 34.5 dBm transmitter power and -15 dBi into the spreadsheet mentioned above, as well as entering the 88 MHz frequency, 48,280 meters (thirty miles) range, 0 dBi antenna gain and -87 dBm receiver sensitivity, gives a -83 dBm signal at the MiG-15s. That's only 4 dB link margin. It would be quite likely that the pilot would not receive the count down clearly beyond 30 miles in typical conditions. I wouldn't bet my life on it! A communications design rule of thumb says get at least 10 dB of link margin to account for real-world vagaries. What's the easiest way to do this quickly? Alter the jet's systems? Not likely. Upgrade the power amplifier of your walkie-talkie? Not without a lot of help from the maker. Instead, use a better antenna! Recall that increasing antenna gain by 6 dB doubles range of transmission (it's a power law). But, if you were able to pull off this feat, you'd be part of a grand spectacle, the kind that makes one wonder...how many person-years of effort go into making a live performance like this? 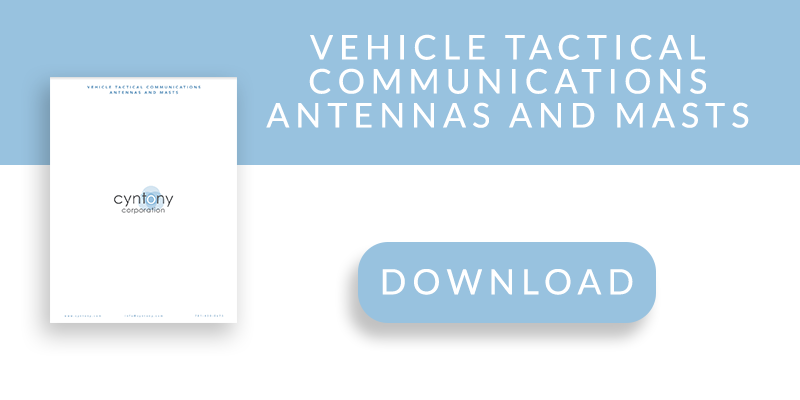 Anyway, when choosing the right antenna for your comms system, try out our Customer Attuned Collaboration process, designed to produce successful outcomes through consideration of real-world use cases and system specifications to optimize the selection of components. Let’s chat to discover the best solution for you.